Additional Yamaha FRP Pool to be built for Water Polo competition at the "9th World Swimming Championships - Fukuoka 2001" - News Releases | Yamaha Motor Co., Ltd.
Additional Yamaha FRP Pool to be built for Water Polo competition at the "9th World Swimming Championships - Fukuoka 2001"
Yamaha Motor Co., Ltd. has been commissioned to supply Yamaha FRP pools for the main swimming competition pool and warmup pool for the "9th World Swimming Championships - Fukuoka 2001" to take place in the city of Fukuoka, Japan, in July of 2001(Venue: Marine Messe Fukuoka, Hakata Ward, Fukuoka City). Now an additional order has been received for Yamaha to build the main pool for the water polo competition as well. This order brings the total of Yamaha FRP pools to be used in the Fukuoka World Championships to three. 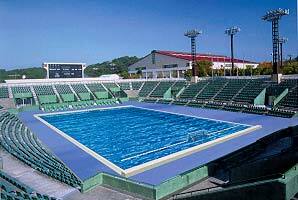 The newly ordered pool will be installed as a special temporary facility at the present site of the center court of the tennis competition facility of the Higashi-Hirao Park Hakata (Hakata Ward, Fukuoka City). The contents of the order include construction and installation of a L35 x W22 x D2 meter main pool for water polo competition, the pool-side facilities, filtration system and all construction involved, as well as maintenance of water quality during the competition period. As with the main pool and warm-up pool, this water polo pool will be installed two weeks before the start of the championships and removed within one week of the end of competition. Yamaha Motor has been a pioneer in the field of FRP (Fiberglass Reinforced Plastic) pools, and in its 26-year history of pool manufacture and sales operations the company has supplied some 20,000 pools to institutions like schools and other public facilities. Because FRP pools can be manufactured in the factory in pre-fab segments, installation is faster than other types of pools. They are also easy to maintain and low in running cost. This additional order for a water polo competition pool for the "9th World Swimming Championships - Fukuoka 2001" is the result of these qualities of FRP pools and the trust that Yamaha has won for its overall product quality and technological excellence as well as the software aspects such as comprehensive maintenance that Yamaha offers. Because special temporary pools like the ones to be supplied by Yamaha in Fukuoka can be installed in existing facilities and make it possible to hold a world-class competition without huge financial investments for permanent sports facilities, it is expected that the use of temporary pools for swimming competitions will spread throughout the world. Building on this important commission to supply FRP pools for the "9th World Swimming Championships - Fukuoka 2001," Yamaha Motor is determined to continue to pursue the development, manufacture and sales of not only temporary pools for competition but all types of pools that contribute to the health and recreation of people in all walks of life.